You'll love the melt-in-your-mouth texture and chocolate flavour of these delicate cookies. Be sure to make extra to share with friends. Beat butter and 1 cup sugar in large bowl with mixer until light and fluffy. Add flour and corn starch; mix well. Stir in chocolate. Roll dough into 60 (1-inch) balls; place, 3 inches apart, on baking sheets. Flatten slightly with bottom of glass. Bake 13 min. or until centres are set and tops are lightly browned; cool on baking sheets 5 min. Add warm cookies, 1 at a time, to remaining sugar; turn to evenly coat both sides of each. Cool completely on wire racks. Prepare as directed using Baker's Bittersweet Chocolate and 1 cup chopped pecans, stirring nuts into dough with the chocolate. You'll know it's a special occasion when the aroma of this special cookie fills the house. 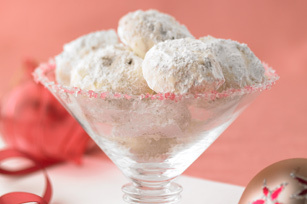 Adding cookies to the icing sugar while warm melts the sugar and creates a frosting-like coating.